“A tract of park-like land, shaded by ancient trees with a sparkling stream running through it” was how Dr. Taliaferro described Ross Valley in 1849. The Coast Miwok practice of burning grasslands, and subsequent Mexican cattle ranching, had suppressed the growth of shrubs under the large oaks of the valley floor and created the scene he encountered. Soon, logging and increasingly intensive livestock grazing made their mark. Redwood and Douglas-fir forests were clear-cut for lumber; oak woodland was harvested for firewood and tan bark; intervening grassland was grazed or cut for hay; and brickworks operated at Larkspur and on the San Quentin peninsula. The bulk of the produce was shipped to San Francisco, via Larkspur and Ross Landing in today’s Kentfield. 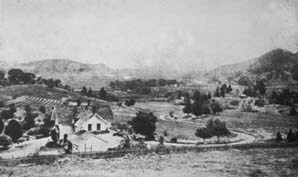 By 1900 small communities were forming the nuclei of Corte Madera, Larkspur, San Anselmo, and Fairfax, served by a railroad from Sausalito, and the valley was dotted with grand landscaped estates. The population grew slowly until the opening of the Golden Gate Bridge in 1937; growth accelerated in the post-Word War II housing boom, and by the 1950s the last dairies in Sleepy Hollow and in the Sorich Creek basin had been closed. The lower reaches of the watershed have mostly been developed; parts of the remaining areas have been set aside as parks and nature reserves. Intermediate elevations are characterized by low-density residential development. The upper reaches of the watershed are dedicated to recreation and domestic local water supply. The areas where large development projects can occur are very few, but in-fill development and redevelopment of existing residential and urban areas is continual.